Saving money is a difficult objective if you go for it without any motivation. 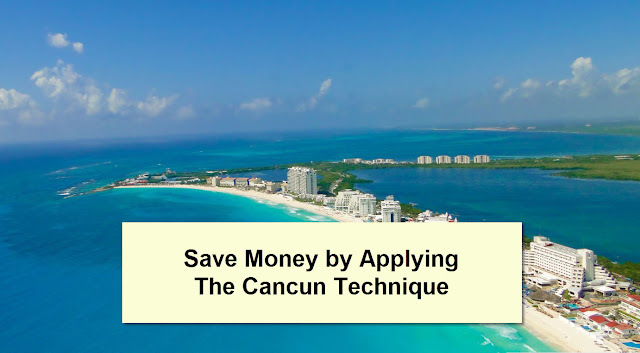 If you have trouble finding such motivation to save some money, you are welcome to use The Cancun Technique, which is a more tangible and realistic way to save. You've probably come across a lot of advice from personal finance specialists whose main focus is to save. But saving money with a specific objective and a payout is much easier than saving just for the sake of saving. If, for instance, you plan to go to Cancun for your next vacation, you could set the amount needed for the trip as your saving goal. You could save each month so that you achieve your goal before your vacation starts. Such a plan will be that motivating force to mobilize you and create a sense of anticipation and satisfaction! Internet advice on saving "accuse" you of not saving, which makes you feel guilty. When you save within a context (vacation, expensive gear, etc. ), saving will become easier. Instead of reducing your expenses, eating less or not buying clothes, have a clearly defined specific goal, which is realistic and tangible. Say, save $4,500 within the next 12 months to go to Cancun for 2 weeks with your significant other. When you want something badly, you are likely to make more effort to have it. If you don't want something, you will probably be looking for excuses. In theory, you would have a rainy-day fund. In reality, though, you will have to have a realistic objective to start saving backed up by anticipation and future reward. It goes without saying that some goals are easier to attain that others. It's easy to add an extra $500 to your vacation savings and not spend this amount while on vacation than stash away $500 each month for your retirement. Long-term savings (retirement and such) don't have the quick payout, which makes us postpone this kind of saving. To fight this one off and start long-term savings, break the big goal into smaller objectives and achieve those. 1. Set a goal with a specific timeframe and dollar amount. Say, you are planning to buy a condo in a year from now. You should how much money you can put down and how much you'll need more for the paperwork. The amount that's missing is your goal for next 12 months. Control your expenses and be the master of what needs to be consumed and what needs to be cut. Go through the same cycle when it comes to saving. Create a new saving habit! Like this saving tip? Have more tips? Share in the comments.